The children at our schools are very poor, many cannot afford school fees, or uniforms, or even the books to write in. Please help us to help them by sponsoring one of our young people. By sponsoring a child through Love In Action you are paying for the education of a child in Uganda. This sponsorship covers school fees, uniform, school requirements and pays for a school lunch every day. Before you choose a child you need to know 3 things! 1. When you have chosen a child and sent in a form, within a few days you will receive a picture of your child with up to date information. 2. As the child will be dependent on your sponsorship we ask that you are faithful in your commitment, and regular in your payments. This is a serious commitment as each child appreciates his/her sponsor very much. 3. We will ensure that the money that you give will be delivered into the hands of people that we trust, and will be used for the benefit of the sponsored children. We provide letters, photos, and school reports on our web site for you to look at and print out. For each child you sponsor approx. 10% goes towards Administration costs in Uganda the rest is spent on Child Sponsorship. Currently the administration work in the UK occurs very little costs and is covered by volunteers. Copies of our accounts are available on request. Please note: While you have a named sponsored child all sponsorship money (including Gift Aid) is pooled in order to provide education for children in Uganda, this ensures that all the children in our care are provided for and benefit from your support. 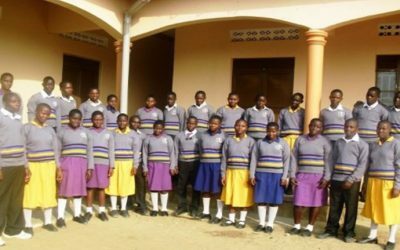 These children are all in Secondary School, sponsorship is £25 per month (or more). Please note: We accept multiple sponsors for these young people up to £25 per month to enable them to go to school. Sometime their guardians are able to help a little. Please choose a child – or there is a button at the bottom of the page for us to choose a child for you.